“Margarine is healthier,” I was told in the 1980s. I still remember moving out of my parents house and buying groceries for the first time in 1985. Like everyone else, I cringe to think that I used to buy that tub of trans fat laden margarine because I thought it was safer for my heart than butter. The sad thing is that most Americans still unknowingly eat this unhealthy fat each day! Fortunately, the FDA has finally intervened and announced this week that “food manufactures” must eliminate added trans fat from our food supply within 3 years. As with lead poisoning, there is no safe level of this toxic fat. Despite this good news from the FDA, there is a catch. Food manufacturers can petition the FDA to keep putting trans fat into their fake food products. Even if the food label says zero trans fat, you are still at risk due to legal loopholes in trans fat reporting requirements. As long as there is less than a half of a gram, food manufacturers do not need to report this. For people who eat a lot of processed foods or eat out a lot, this can really add up. A large percentage of fast food establishments, restaurants, and bakeries still use this fat. In this article I will share with you how to protect yourself from the 7 most dangerous foods for your heart. These 7 foods are those highest in trans fat. Why Should We Worry About Trans Fat? Trans fat causes inflammation to our arteries. It also dramatically raises our bad cholesterol (LDL) and lowers our good cholesterol (HDL). The end result is rapid plaque build up within our heart. The CDC estimates that trans fat causes up to 20,000 heart attacks and 7,000 unnecessary heart deaths each year in the U.S.
Why Does the Food Industry Like Trans Fat? Why do food manufacturers still insist on putting this fat into their products? The answer is because it gives fake food products a shelf life that just may be longer than your own life. In addition to a long shelf life, some claim that trans fat makes things “taste better.” Lastly, when frying with trans fat, you can re-use the oil over and over. It might surprise you to learn that trans fat is also found in meat and dairy. Grass fed animals may even have more trans fat than grain fed animals. I should note that the chemical structure of naturally occurring trans fat is different from that of the man-made variety we have discussed thus far in this article. Fortunately, the natural forms of trans fat don’t seem to present the same cardiovascular risks. To stay on the safe side, it may be wise to eat leaner cuts of animal meat. Why Are Cholesterol Levels Falling? Something strange is happening in the U.S. Despite the fact that we are gaining more and more weight, our cholesterol numbers keep dropping. The pharmaceutical industry would like us to believe that this is due to the cholesterol lowering, “statin” drug, prescriptions being written. Personally, I believe it is because we have been gradually phasing trans fat out of our diet. As mentioned, trans fat raises our bad cholesterol (LDL) and lowers our good cholesterol (HDL). Since the FDA loosely required food manufacturers to report trans fat in 2003, we have reduced our consumption of this fat by 78%. Interestingly, over this same period of time, the number of people with high cholesterol in the U.S. has dropped by 27%. Not only have our cholesterol levels dropped but the number of heart stent procedures has declined by 28% and cardiac bypass surgeries have gone down by 46% during this same period of time. I suspect that much of this decrease has occurred due to the gradual elimination of trans fat from our diets. As if the sugar and refined grains were not dangerous for your heart, the trans fat in many commercially prepared pastries delivers the triple hit to your heart. Never eat cookies, cakes, donuts, or pies without first checking the label to see if there are partially hydrogenated oils. Commercially prepared frosting and refrigerated dough can also be high in trans fat. Even breads or crackers may contain trans fat. If you want to have a pastry, try making a healthier version at home without all of the sugar, refined grains, or trans fat. For suggestions on healthier options, please review the many recipes my wife has posted on our website. Margarine was the poster child for trans fat a generation ago. Shortening is another common source of trans fat. Fortunately, Crisco has recently eliminated trans fat. If you want to use a healthier oil, try using olive oil or coconut oil. There are many healthier options than margarine or shortening. French fries and fried foods are often fried in trans fat. If you love French fries, try baking your own at home with a little bit of olive oil and sea salt. Homemade sweet potato fries can be especially healthy. Potato chips and other chips often contain trans fat. If you like the taste of chips, consider switching to kale chips. Better yet, make your own kale chips at home with some olive oil and sea salt. Candy can be another source of trans fat. If you love your sweets, like me, consider switching to dark chocolate instead. With regards to health, the darker the chocolate the better. Dark chocolate has much less added sugar than milk chocolate. Frozen pizzas are yet another source of hidden trans fat and other heart unfriendly ingredients. Consider making your own pizza. It is surprisingly easier than you think. You can even include almond flour and coconut flour into your homemade pizza dough recipe. Microwave popcorn often contains trans fat. Movie theater popcorn is no better. If you love popcorn you can still eat it–just try the air pop variety at home. The key message is that trans fat is still in our food supply and there is no safe amount you can eat. If you buy processed or prepared foods, you must ensure that partially hydrogenated oil or shortening is not listed anywhere on the ingredient list. If you like to eat out, ask the manager, or your server, what types of oils are used. Was it hard for you to eliminate trans fat from your diet? Jeff struggled with weight issues his entire life. He was a computer programmer and told me, “I do my best work between 8 pm and midnight.” Does this also sound like you? The trouble was that he was always hungry late at night, had troubles getting up in the morning, and was now was seeing me for heart problems. Could his night owl ways be contributing to his heart condition? One third of all adults are night owls. Are you one of them? In this article we will explore what makes people night owls, the health risks of night owls, and 9 ways to stop being a night owl. Is There a Genetic Basis to Night Owls? Some night owls have told me that they are genetically “hard-wired” to stay up late at night. Could this be true? People with the CLOCK gene have a genetic predisposition to an altered circadian rhythm. The circadian rhythm is your built in 24 hour clock. This genetic tendency toward an altered circadian rhythm keeps them up at night unless they are careful to control their environment. Mice possessing the CLOCK gene have been studied extensively. In these mice, not only is their circadian rhythm out of sync with the sun causing sleep disorders, but they also frequently suffer from mood changes, difficulties with pregnancy, and with obesity. In humans, studies show that people with the CLOCK gene also frequently suffer from attention deficit disorder (ADD or ADHD). From these studies, the genes controlling for circadian rhythm are also tightly linked to mood, weight gain, and concentration. Even if you have the CLOCK gene, are you destined to be a night owl for the rest of your life? Many researchers have said that the equation for obesity is really quite simple. Obesity equals the wrong genes plus a modern lifestyle. The same could be true of night owls. The night owl syndrome also equals the wrong genes plus our modern lifestyle. Let me explain. For the first week of the study, they extensively studied these people in their natural “modern lifestyle” sleeping state. For the second week of the study, they took these people high up in the Rocky Mountains. There, they camped in a location far away from any light pollution. Also, as part of the study, all electronic devices or artificial light, including flashlights, were completely banned. Study participants did have access to campfire light at night. 1. People fell asleep and awoke 2 hours earlier in a natural environment. 2. People were exposed to 4-times more light during the day in a natural environment. 3. Natural melatonin production began at sunset. 4. Natural melatonin production turned off with sunrise. 5. No one suffered from insomnia. Are There Night Owls in China’s Longevity Village? An interesting question is whether or not there are any night owls in more natural or ancestral environments. The answer is generally, “no.” Based on our study of China’s Longevity Village, until recently there were no night owls. Electric lighting is a recent phenomenon to this Village. Prior to electric lights, night owls didn’t exist when all you had were fires or candles. Modern studies have shown that the wavelength of light from fires and candles is such that it does not activate the brain the same way blue light does from electric lights and electronic devices. What lessons can we learn from the Rocky Mountain Sleep Study and from China’s Longevity Village? The take home message is that if people are exposed to natural light during the day and have no access to artificial light at night then their circadian rhythm will naturally be in sync with the sun. The converse is also true. Locking ourselves up in dark homes or offices during the day and then living by electric light and electronic devices at night will bring out the night owl tendencies in anyone. This gets back to the equation of a night owl. A night owl equals genetic tendencies plus a modern lifestyle. If you take away one component of this equation then the night owls go away. Does it really matter if you are a night owl or not? Can this just be a “benign” lifestyle choice? Are there any dangers of having an altered circadian rhythm? The most extreme example of night owls are shift workers. People who work graveyard shifts are the most extreme examples of night owls. Their nights and days are completely reversed. What are the health risks of shift workers? In one of the largest studies ever done, researchers found a 23% increased risk of heart attacks in shift workers in this study of 2,011,935 people. Not only do shift workers suffer more heart attacks, they also are much more likely to get cancer. It is not just shift workers who are at risk. Studies of people who travel and suffer from frequent jet lag have the same risks as shift workers. For those who just prefer going to bed later, here are the health risks according to published medical studies. I have hyperlinked each health risk with the medical study supporting this finding. As you can see, the medical studies of night owls don’t look good. If you suffer from the night owl syndrome, let me give you 9 ways to stop being a night owl and start enjoying better health now. The old adage, “don’t fight the sun” really is true. If there is one time of the day that is most important to get bright light, it is the first thing in the morning. This bright and natural morning light will reset your own internal circadian rhythm and get you back in sync with the sun. The morning sun is also critical to maintaining a healthy weight. Indeed, studies show that morning light accounts for 34% of our body mass index or BMI. Thus, if you have been struggling with weight issues your entire life, perhaps the solution is as simple as going outside first thing in the morning for 30 minutes to get some natural morning light from the sun. Even if you are not a shift worker or suffer from jet lag, just prolonged exposure to artificial light at night may increase the risk of breast cancer. With work deadlines, kid homework, etc. it can be impossible in our modern lives to eliminate all artificial light at night. This artificial light, or blue light, throws our circadian rhythm off. Studies show that even brief exposure to blue light at night can delay sleep by 30 minutes. Additional research shows that artificial light exposure at night not only delays natural melatonin release but that it also shortens it throughout the night making it more likely that you will wake up through the night. So how can we survive in this modern world without artificial light at night? The answer may be as simple as wearing orange glasses after dinner to filter out the blue light. Yes, this photo shows me sporting my new orange glasses. Studies support that blue light shielding glasses have been shown to improve sleep. This is what we have started doing at our home. It does seem to help. While blue light filtering glasses may help, electronic devices are one of the biggest causes of the night owl syndrome. Indeed, electronic devices may account for 50% of all sleep disorders according to the 2014 National Sleep Foundation Poll. To stop the evening stress and cortisol stimulation, as well as the blue light stimulation, turn off all electronic devices after dinner. This includes TVs, computers, phones, iPads, etc. If you absolutely must use an electronic device at night, then either use blue light filtering glasses or download blue light shielding apps for your computer, iPad, or smart phones. Here is a blog article to learn more about blue light filtering apps. I am not aware of any filtering devices yet for TVs. 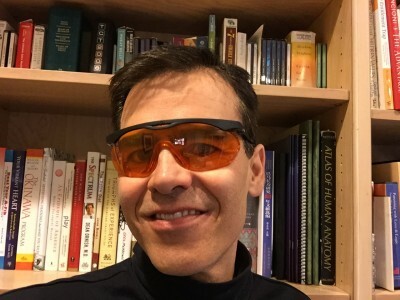 If walking around your house with orange glasses or goggles on at night to filter out blue light doesn’t sound like something you want to do, a simpler approach is to just dim the lights in your house at night. Dimming the lights at night can somewhat approximate “sunset” to your body and start to get the natural melatonin production from the pineal gland started. Countless studies have shown that maintaining physical activity during the day helps with sleep at night. Even better would be to exercise outside each day. This natural light exposure helps with keeping our circadian rhythms in sync with the sun. To keep our body’s circadian rhythm in sync with the sun, getting as much bright light during the day is critical. Don’t despair, even if you work in a dark office there are still things you can do. For example, try taking a walk outside on your lunch break. Exposure to the midday sun will help to keep your body in rhythm. Other options include purchasing a blue light device for your office during the day. Because of their genetic tendency, night owls have to be very strict in maintaining a consistent bedtime schedule. It is so easy to get involved in a task and then discover it is suddenly 1 am! For most of my patients, they would be much better off to set a bedtime alarm clock instead of a morning alarm clock. Indeed, for many of these patients, the real reason why they are seeing me in my cardiology practice is because they are chronically sleep deprived. Studies report that night owls tend to have lower levels of vitamin D. As you know, low vitamin D has been linked with just about every medical condition imaginable. The cause is probably because they are fighting the sun and are not getting outside enough. Regardless of the cause, talk to your physician about getting your vitamin D levels tested. If they are low, get them back into the normal range through natural sunlight in a sun-smart way or through high vitamin D containing foods, like salmon, or through supplements under the direction of your physician. The data for melatonin supplements as a sleep aid are strongest for people suffering from jet lag. In these studies, melatonin supplements seem to help them regain their natural circadian rhythm. While melatonin has not been formally tested in people suffering from the night owl syndrome, anecdotally it seems to help some of my patients. If you are considering melatonin supplements, please discuss this with your physician first. Do you suffer from the night owl syndrome? What have you found that helps you to get your circadian rhythm back in sync with the sun? More than four in 10 Americans will die from a heart attack or other heart problems. Not only is heart disease still the number one killer for both men and women but the same people who suffer from heart problems are also the ones more likely to suffer from Alzheimer’s Disease, strokes, and poor brain function later in life. Is it possible to bulletproof your heart so that regardless of your diet or how much you exercise you won’t suffer from heart or brain problems later in life? When I was a medical student at Johns Hopkins in the early 1990s we were all taught the risk factors for heart disease. Namely, if you don’t smoke, you don’t have diabetes, your cholesterol and blood pressure are in check, and there is no family history of heart disease then it would be very unlikely for you to have a heart attack. As I have progressed further in my career and research I have come to learn that there are far more factors at play. Indeed, these “other factors” may be just as important as the big five I was taught in medical school. Let’s explore this concept further. Welcome to a small mysterious town in Pennsylvania where people seemed to magically be protected from heart problems despite a poor diet, high rates of smoking, high cholesterol, and a lack of exercise. In 1961, at the height of the heart disease epidemic in the U.S., a local Roseto doctor happened to mention to Dr. Stewart Wolf from the University of Oklahoma that heart disease was virtually nonexistent in Roseto. From this chance conversation, outside researchers quickly converged on this small town. With the blessing of the mayor of Roseto, everyone in the village was studied. They collected blood samples, monitored what they ate, and basically how they lived their lives. Researchers poured over every death certificate and interviewed everyone. After spending several years in this small town they had their answer. As reported in the prestigious Journal of the American Medical Association in 1964, and later by Malcolm Gladwell in his bestselling book Outliers (affiliate link), Roseto was a small community where people ate all of the wrong foods and had high rates of obesity and smoking, had high cholesterol, breathed toxic fumes from working in the slate quarries, and yet somehow were protected against heart disease. Indeed, the risk of a heart attack in this small Italian village in Pennsylvania was just half as much as the five surrounding towns. How can this be? How can you do everything apparently “wrong” for your heart and yet be protected from a heart attack? There had to be an explanation for this paradox. At the time, Roseto was a small tightly knit community of Italian immigrants living about 75 miles west of New York City. This village was settled in 1882 by Italian immigrants from Roseto Valfortore in Italy. When they immigrated to the New World they kept their exact same social structure as they did in Italy. This was a socially isolated village. They only married within the community, kept to themselves, spoke Italian, worshiped God, only shopped at their own local small stores, and lived as three generational families under the same roof. The worked at the numerous local slate quarries and lived the “old” Italian way even though the rest of the country had already gone through rapid changes in the years following World War II. You may be wondering, how can you eat all of the wrong foods, gain weight, smoke, and have a high cholesterol but yet not develop any heart problems? Let me outline the key factors as to why a heart attack was an incredibly rare event in Roseto. If we can maintain a healthy lifestyle, unlike the Rosetans, and incorporate these additional four factors then we can truly “bulletproof” our hearts. For the Rosetans, family was everything. Families were close and multiple generations all lived within the same home. Families were self sufficient and took care of their own. Indeed, there have been countless studies in the medical literature supporting the fact that strong marriage and family relationships can protect us from heart attacks. As the quality of our family relationships has such a profound effect on our heart health the question is what can we do to strengthen these relationships? For me, what has helped the most is to put the needs of my family ahead of my own. As I give of myself it always seems that in the end my needs are met as well. Also, given my busy lifestyle, I have found that what gets scheduled gets done. In other words, the calendar on my iPhone is also filled with many family events including scheduled one on one time with family members. On Sundays, everyone in Roseto went to church. It was a God fearing community. They had strong Christian values and were very spiritual people. They cared for their neighbors and looked after each other. As with strong family relationships, many studies have shown that religion and spirituality can protect us not only from heart disease but many other chronic medical conditions as well. Even if you are not religious, taking time to care for your spiritual needs can be very therapeutic. In our family, we worship together at church each Sunday. Even if it is a boring sermon at least you can tell yourself that, based on medical studies, you are getting healthier each time you go to church. From a socioeconomic standpoint, you did not know in Roseto who was rich or poor. There was no keeping up with your neighbors. Even if you were wealthy it was socially taboo to display your wealth. The community cared for everyone. If a neighbor was in need, everyone came to help. They were all “brothers” and “sisters” in the community. Once again, there is a vast body of scientific data that socioeconomic disparities or even perceived disparities can lead to heart attacks. Trying to keep up with your neighbors or peer group will drive you crazy and cause undo stress on your heart. At the end of the day, all we really need to be happy is a safe home with enough food and loving relationships. Despite difficult working environments at the slate quarries, Rosetans perceived very low levels of stress. They put their worries into God’s hands and knew that whatever happened in life their family and community would always be there to help. Crime was nonexistent in this village. Based on all of the studies published to date, it goes without question that perceived stress is a powerful predictor of who will get a heart attack. Much has been said about stress and I have published many blog articles on the subject as well. For me, the three most important things in keeping my stress levels in check are to live as healthy as possible, always plan to arrive or be ready 15 minutes early, and to always look for ways to simplify my life. As we can eliminate the “clutter” in our lives and focus on that which is truly essential we can minimize our perceived stress. By now you are probably considering moving to Roseto, PA and living a utopian life free of heart disease, stress, and worries. Indeed, this is where Malcolm Gladwell left off in his book Outliers (affiliate link). I wish this is where the story ended but unfortunately there was an unravelling of the Roseto Effect. Today, Rosetans no longer have “bulletproof” hearts. Let me now share with you what happened in the late 1960s. By the time the late 196os rolled around, the American way of life had infiltrated the village. They still ate poorly, smoked, and failed to exercise. However, now they began intermarrying, families started to split up, religion was no longer the glue to the community, and the pursuit of wealth and materialism was in full swing. Indeed, by the 1970s Roseto was no different than the neighboring towns and their heart attack risk became the same as everyone else as well. They were no longer bulletproof. What is the lesson of the Roseto Effect? In medical circles, the term “Roseto Effect” has come to describe how a close-knit community can escape the risks of heart attacks. When Rosetans lost the Roseto Effect they then fell victim to the consequences of their unhealthy lifestyles. While the Roseto Effect is NOT an excuse to live an unhealthy lifestyle, it does show that by having close family relationships, living a spiritual life, caring for neighbors, and minimizing the effect of stress in our lives, we can escape many of the unnecessary chronic medical conditions like heart disease. Do you have the Roseto Effect working in your life? Is your heart bulletproof? #047 Do Processed Foods Cause Memory Loss? Do Processed Foods Cause Memory Loss? Can what we eat actually affect our memory? Yes, according to a study just recently presented at the American Heart Association’s annual scientific sessions in Chicago. This study showed that trans fat, which is common in processed and fast foods, can cause memory loss in even younger adults. Can You Believe Trans Fat Food Labels? You may be thinking, “I always read the labels and make sure that I do not buy any food with trans fat.” But sometimes the labels are not clear. For example, a Fig Newton bar, which is even made with “real fruit” and is freely given to patients at my hospital, lists 0 grams of trans fat. However, upon closer inspection of the ingredient list you will notice that it contains partially hydrogenated cottonseed oil. Whenever you see “partially hydrogenated” or “shortening” listed on the ingredient list it is a trans fat. This is a man made “Franken Fat” that improves the shelf life of the food like substance but decreases our own shelf life. The problem is with our labeling laws in the U.S. Many other countries have much stricter labeling laws. As long as you have less than 0.5 grams of trans fat per serving in the U.S., you can legally advertise “0 trans fat”. Although technically legal in the U.S., this is deceptive food labeling and many “food” companies participate in this practice. How Much Trans Fat Do Americans Still Eat? Another problem is that most serving sizes are not realistic. Many people eat much more than one measly little serving as defined on the food label. Also, trans fat is still in so many of our foods such as fast food, pizza, french fries, biscuits, bakery items, and a large percentage of packaged foods. At the end of the day, the average American has eaten 5.8 grams of trans fat from all of these food like products. No amount of trans fat is safe. Even the FDA realizes this and is working to ban this man-made trans fat from the American diet. Trans fat dramatically increases both the bad cholesterol numbers and the risk of heart disease. Trans fat has also been linked to obesity, cancer, diabetes, and depression. Clearly, our goal is to completely avoid this very dangerous man-made fat. This study, recently presented at the American Heart Association annual meeting in Chicago, was interesting in that even younger adults (ages 20-45) showed significant memory loss after eating trans fat (here is a link to the news report of this study). Specifically, they looked at 1,018 people and found that for every one gram of trans fat they ate each day resulted in a memory loss of 0.76 words on their memory test. The biggest offenders of trans fat younger adults remembered 11 less words that those who tried to avoid these man made fat-like chemicals. As the memory test only involved 104 words, this becomes even more remarkable. A “healthy” young adult lost 10% of their memory just from eating junk food. One could not help but ask, how is this memory loss from junk food affecting them in their schooling or with their jobs? If these young and middle aged adults were showing memory loss from processed foods is it any wonder that Alzheimer’s Disease has also been linked to a diet high in trans fat? Fortunately, with recent labelling laws and other regulations, we are eating much less trans fat now than we did a generation ago. Our average cholesterol numbers in the U.S. have been dropping and most feel the major driver has been less trans fat in our diets. The recent decline we have seen in heart disease nationwide is also felt to be due to lower amounts of trans fat in our diets. However, if one eats out a lot or purchases processed foods you are still exposed to this dangerous man-made fat. To answer the question, do processed foods cause memory loss the answer is clearly yes according to this most recent study. As the goal is really zero trans fat in our diet, not the deceptive “0 grams of trans fat” that you see on so many food labels, here are my six rules to completely eliminate this toxic trans fat from your diet. 1. Do not eat anything with “partially hydrogenated” or “shortening” listed on the ingredient list. 2. Assume french fries contain trans fat unless proven otherwise. 3. Assume all pastries, cookies, cakes, pies, and other bakery items contain trans fat unless you are shown proof that they do not. 4. Assume anything fried or battered is trans fat until they can prove to you otherwise. 5. Assume anything that tastes like butter has trans fat unless you can see the ingredient list. 6. Assume any popcorn has trans fat unless you air pop your own corn yourself. Has your memory or brain fog lifted with elimination of processed and fast foods? What rules do you follow to keep trans fat out of your diet? #042 Should I Eat Fish? Do you like fish? Based on its profound health benefits, you may decide to become a fish lover, if not one already. If you eat at least two servings per week, studies suggest that you can extend your life by 2.2 years! Not only will you live longer but fish will also decrease your risk of heart disease by 36%, help to prevent dementia, lower your triglycerides, and lower your blood pressure. In this article I will discuss the health effects of eating fish and answer the question, should I eat fish? I did not always like fish. In fact, I hated fish until this past year. I hated the smell, texture, and taste. Now, at the age of 47, I can say for the first time publicly that I like fish. I am not really sure how I finally came to like the taste of fish. It was something that happened very gradually. As I became increasingly convinced of the health benefits of fish, I forced myself to start eating it. Slowly, over time, I began to enjoy the taste. Now I love my wild Alaskan salmon! Indeed, it has been scientifically proven that people can learn to like foods they previously hated. This was certainly the case with me. Can eating oily fish really allow you to live longer? Yes, according to a recent study by my friend, Dr. Dariush Mozaffarian, at Harvard University. I should mention that Dariush and I did our residency training together many years ago at Stanford University in the 1990s. In Dariush’s study of 2,692 people followed for 16 years, he found that the highest oily fish eaters not only lived 2.2 years longer but also had 40% lower risk of dying from heart disease, 47% lower risk of dying from a stroke, and a 45% lower risk of dying from an arrhythmia. Dariush concluded in an interview that the minimum amount of oily fish needed to get these benefits seen in this study works out to be about two servings per week. If a life long fish hater, like me, can learn to like fish at the age of 47 then this is something that we can all learn to like. Based on the very strong scientific data supporting fish in our diets, the American Heart Association recommends that we eat at least two servings of fish each week, preferably an oily fish high in the omega 3 fatty acids. Despite these recommendations, less than 1 in 5 Americans follow these guidelines. Even scarier is that about half of us really don’t eat fish at all. Can I get all of my omega 3s from nuts and seeds? Not all omega 3 fatty acids are created equal. The omega 3 fatty acids in walnuts, chia seeds, hemp seeds, or flax seeds are the short chain omega 3s (ALA). The omega 3s in fish are the long chain omega 3 fatty acids or EPA and DHA. EPA and DHA have the best track record for long-term health benefits. While the body can convert some of the shorter chain omega 3s from walnuts, chia seeds, hemp seeds, and flax seeds to EPA and DHA, most of us will be lacking in these critical omega 3s unless we eat fish. For vegetarians, you can get your DHA and EPA from where the fish do, namely marine algae. Why do so many people avoid fish? I suspect that the media’s hyped fear of mercury, dioxins, and PCBs in fish has frightened so many people from eating this incredibly heart healthy food. Fish is healing food for the heart and brain. Unfortunately, these industrial pollutants have made their way into our food supply, including fish. However, as long as you are eating the right fish in the right amounts you don’t need to worry about mercury, PCBs, or dioxins. Let me explain. Unfortunately, the fish available to us today is not the same fish that was available to our ancestors. Today, we have to worry about mercury toxicity with fish. While the media would have us to believe that any fish will poison us with mercury that it absolutely not the case. Many of my patients are afraid to eat fish based on all of these media reports. While the media has done a good job of scaring us away from fish due to mercury risks, what they don’t tell us is that selenium binds mercury and gets it out of our body. Fortunately, many fish are also very high in selenium so any potential mercury risks in these fish is extremely low. Previous studies showing harm from mercury in fish were done with shark or pilot whale meat which are very low in selenium. For example, just one serving of salmon, sardines, tuna, or shrimp nearly give you all of the selenium you need for the day. As the right amount of selenium in your diet has been shown to help protect against cancer and heart disease, to make sure you are getting enough just one Brazil nut will give you all the selenium you need for the day. Work closely with your doctor if you are taking a selenium supplement as selenium supplements have been shown to cause harm. Once again, the media would scare us from eating fish due to the risks of PCBs and dioxins. While we should be frightened of PCBs and dioxins from industrial pollution, fish is not where we get most of these carcinogens. For example, according to a Harvard University report, more than 90% of the PCBs and dioxins we are exposed to come primarily from animal meat, dairy, eggs, and to a much lesser degree from vegetables. Thus, if you are really frightened of PCBs and dioxins then you should also limit your intake of animal meat, dairy, and eggs. This Harvard University report also states that if 100,000 people ate farmed salmon, which has 16 times the amount of PCBs and dioxins as wild salmon, for 70 years that it would cause 24 deaths from cancer. However, eating farmed salmon over this same period of time would also prevent 7,000 people from dying of heart disease! For me, I want the best of both worlds. I want all of the protection salmon has to offer without the risk of cancer. This is why I choose wild Alaskan salmon which is 16 times lower in these contaminants according the the Environmental Working Group and I eat one Brazil nut each day. Can I just take fish oil instead of eating fish? Perhaps it is because you don’t like the taste of fish or that it just is easier to take a pill. Unfortunately, when it comes to health it doesn’t work that way. Many vitamins and supplements, including vitamins C and E, beta-carotene, folic acid, estrogen, and testosterone, have all been linked to heart disease or cancer. Fish oil is no exception. Even fish oil, with its healthy halo effect, has been linked to prostate cancer. It is a combination of everything in healthy fish that provides us with the health benefits not just a concentrated form of the omega 3s. Nutrition is so much more than just isolated and concentrated compounds. If you don’t like the taste of fish it has been scientifically shown that you can retrain your brain to like healthy foods. I know this was definitely the case with me. It was probably knowing all of the good things I was feeding my body that allowed me to start liking wild Alaskan salmon. Here are some of the amazing health benefits you get from just one four ounce serving of this salmon according to WHFoods website. Even better, all of these nutrients come with only 158 calories! 1. Eat fish twice a week. 2. Focus on oily fish with the omega 3s. 3. Avoid the fish high in mercury, dioxins, and PCBs. 4. Get the right amount of dietary selenium to bind mercury. 5. I avoid fish oil supplements due to the link to prostate cancer. To get back to our original question, should I eat fish? My answer would be yes given the many health benefits of fish. Have you always liked fish or did you learn to like it like me? Do you have a favorite fish? Please leave me a comment and let me know! Could a recent study that hit worldwide news, provide enough evidence to overturn the long-held belief that a little alcohol is good for the heart? According to the Center for Disease Control (CDC), one in ten deaths of working age adults in the U.S. results from alcohol consumption. Despite this fact, many in the medical community have been telling us for years that a little bit of alcohol is good for us as it prevents coronary heart disease (plaque build up in the arteries of the heart). What are the effects of alcohol on the heart? Is there a link between alcohol and heart disease? This recommendation to drink a little bit of alcohol did not come from high quality studies. This recommendation came from observational studies based on how much alcohol people said they drank. So many of us wanted to believe that this vice could actually be healthy for us, so few questioned if this was even true or not. This groundbreaking and scientifically rigorous study of 261,991 people hit worldwide news demonstrating that any alcohol may be hazardous to your heart health. For years I have struggled with this alcohol conundrum in counseling cardiac patients. On one hand, alcohol, especially red wine, appeared to be very effective in preventing plaque build up in the heart. This was the “heart” of the so-called “French Paradox” where supposedly their red wine protects their hearts from their high saturated fat diet. On the other hand, I have personally seen, and the tragic data shows, that alcohol destroys many families, and causes liver failure and cancer. While alcohol was believed to prevent coronary heart disease, it is a known cause of heart failure and the most common cardiac arrhythmia, atrial fibrillation. I struggled as to how I could best counsel my patients on the subject of alcohol. With regards to alcohol and heart disease, my conclusion at the time was to advise limiting alcohol to one drink daily, if they drank, preferably a red wine. This way we could potentially minimize any negative bad effects of alcohol on the heart. If they did not drink, I never encouraged drinking to prevent coronary heart disease. Lastly, if they suffered from heart failure or atrial fibrillation I recommended that they stop drinking. I advised such based on the available data—it was all we had. I now advise differently, as the latest study provides new findings. This study is very important in that it is much more scientifically rigorous than previous studies. The data behind the alcohol recommendation to prevent coronary heart disease was based on observational studies. Observational studies have to be taken with a grain of salt because there are so many confounding factors which researchers cannot control. Could observational study bias explain the alcohol protective dogma that the medical community has believed for so long? Do we need to worry about alcohol and heart disease? In this study, first author Dr. Michael V. Holmes from the Perelman School of Medicine in Philadelphia, Pennsylvania and colleagues took a different approach. Rather than just doing yet another observation study based on the subjective recall of how much alcohol everyone drank, they looked at whether or not people had the ADH1B gene. The ADH1B gene codes for the alcohol dehydrogenase 1B enzyme which breaks down alcohol in the body. People with this enzyme rapidly metabolize alcohol which results in nausea, facial flushing, and not feeling well when they drink alcohol. As a result, most people with the ADH1B gene drink very little alcohol or they abstain altogether. In this study, Dr. Holmes and his colleagues had the brilliant idea to look at the clinical outcomes of 261,991 people in this international study to see if this gene could predict clinical outcomes. Overnight, this study has challenged the long-held dogma that alcohol might somehow be good for the heart. We now have a pretty good idea about the effects of alcohol on the heart. This study supports our findings during our stay among the residents of China’s Longevity Village. Based on our research in China’s Longevity Village, which is a rural mountain village in Southwest China near the Vietnam border, most of these long-lived people completely abstain from alcohol. These people were historically water drinkers. This abstinence is largely based on their extreme poverty and geographic isolation from China and the rest of the world. In fact, based on studies of these long-lived people, 64% of the people completely abstain from alcohol. Could this be one factor, among many, that contributed to their long lives and freedom from the chronic medical conditions from which so many of us here in the U.S. suffer? We delve into our findings in China’s Longevity Village, and their implications for our own lives here in the U.S., in our book scheduled for publication next year. The results of the more than 260,000 people in this study demonstrate that alcohol does not have any protective effect to the heart. In my opinion, given the many tragic outcomes of alcohol consumption, the less alcohol we drink the better. For my patients who have developed any form of heart disease, I now encourage them to avoid or minimize alcohol consumption. Not only is it this study, another mega study just came out in the July 22, 2014 issue of Journal of the American College of Cardiology showing that any alcohol can be a significant cause of a dangerous heart rhythm abnormality called atrial fibrillation. What do you think? Is this study strong enough to overturn the long held belief that alcohol is somehow protective for the heart? You can leave a comment by clicking here. Did you know that taking regular vacations can help you to prevent a heart attack? While it seems strange, most Americans do not take their full vacation time. I was the same way once. It really makes no sense at all. According to the 2013 Work Stress Survey, 83% of Americans reported being stress out at work. Where are you right now in your life? Are you buried at work? Is stress crushing you? The problem is that as Americans we just do not take many vacations. While Europeans get up to 30 days of paid vacation each year, we just get 14 days. Even with these 14 days of vacation, the average American only takes 10 days off. I get this. I used to be the same way. I would never take any time off. I would let my vacation time go unused so that I could work more. Seems strange doesn’t it? It was not until I hit my own health crisis a few years ago that I started taking vacations. Now I know that vacations are absolutely critical to our health, happiness, and longevity! Let me give you 6 Reasons Why You Need a Vacation Now! We just do not do a good job of dealing with stress in our modern lives. 70% of all doctor visits are due to stress or illnesses brought on or made worse by stress. I see this every day in my medical practice. In fact In a study of 1500 women in Wisconsin, those who rarely took vacations were 90% more stressed out than those who regularly took vacations. While we have always been taught money cannot buy you happiness, that is not always the case. Studies have shown that spending money on life experiences, such as vacations, actually improve happiness. Interestingly, in a study of 1,530 Dutch people, vacations seem to boost their pre-trip happiness the most. Somehow, just thinking about your upcoming vacation makes you happier. I know this is the case for our family. For the last 20+ years our annual family vacation has been on my parent’s houseboat at Lake Powell. If we even bring up Lake Powell our kids instantly become joyous! Now that I am thinking about this vacation, I can already feel my spirits lifting! Yes, vacations can give you more energy! Perhaps it is because they give you a new perspective on life or a chance just to de-stress. Regardless, from the Wisconsin study cited above, women who rarely took vacations were 67% more tired and fatigued than those who regularly took vacations. Can you really improve your marriage just by taking a vacation? Yes, according to the results of this Wisconsin study. In this study, women who regularly took vacations reported 55% more satisfaction with their marriage. Vacations give us a chance to reconnect with those that are most important in our lives free from all of the stressors of everyday life. Yes, a vacation will help to save you from ever developing heart disease! In fact, from over 12,000 men followed for 9 years in the MRFIT Trial, those who regularly took vacations were 29% less likely to die from a heart attack. Studies of women have shown the same heart protective effects of vacation. Vacationing is indeed good for your heart! If all of the above benefits were not enough, those who regularly take vacations live longer than those who do not. Based on the MRFIT Study above, regular vacationers were 17% less likely to die over the 9 years of the study. What if I can’t afford a vacation? You may be thinking, yeah that all sounds great Dr. Day but my wife and I just cannot afford a vacation right now. Vacations do not have to be expensive. In fact, you could even do a “stay’cation”. Stay’cations, if done right, can yield the exact same health benefits. Of course, a stay’cation does not mean stay home and do chores around the house. It means to get out and explore the area around where you live! My challenge to each of you is to take some time and plan a vacation with your family or friends today. There is no better time than the present. It just might make you happier! How have vacations helped you in your life? What was your best vacation? You can leave a comment by clicking here.